Honeybees are a very cool species, they are said to be the only insects that create food and have health and medicinal application for humans. Like much of nature, there is a lot that can be learned from honeybees. 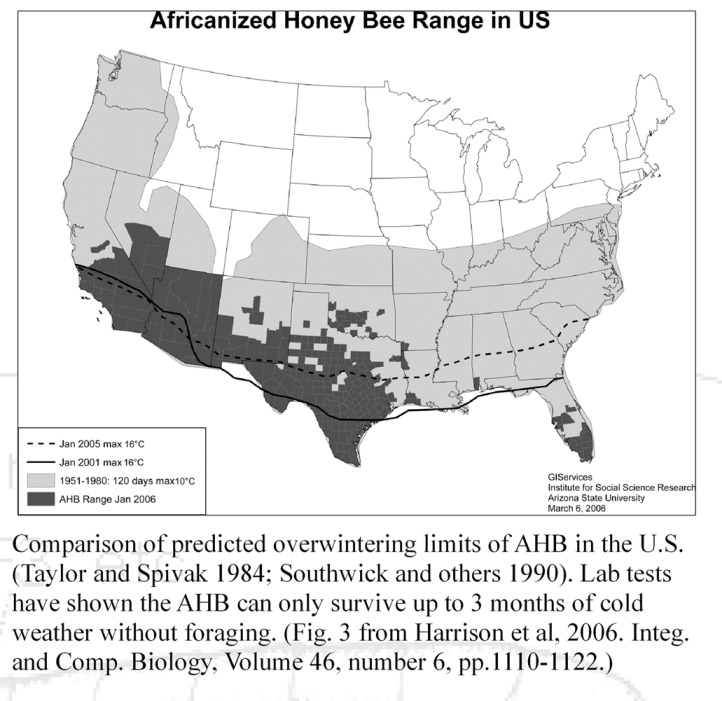 The following study is based on my own reading and observation of AHB's while removing honeybees for many years across the lower region of the U.S. where AHB co-exists with, intermingle, cross-breed, and in some areas outperform the traditional European honeybee. Can Bees from Africa Survive Cold Weather? Are there AHB's / Killer Bees in my State? What Makes Africanized Bees Angry? Why Have My Honeybees Become More Aggressive? Are Africanized Bees Bad Bees? The Africanized honeybee dubbed by the media as killer bees, is a cross between the European honeybee and honeybees from Africa. There are no known records of ancient beekeeping in Africa; the historical practice of beekeeping in Africa is relatively new compared to Europe. In Africa humans, as well as animals, the Ratel or honey badger (among other predators) would destroy the beehive to get the honey. Other extreme conditions of Africa likely created an environment were the more feral or aggressive beehive survived; the fiercer the honeybees in their ability to protect their home and to relocate to live-able or safe areas likely would better survive. This could be what caused the African honeybee to developed differently over time than the honeybee from Europe. In the 1950's, European honeybees were the preferred bee for South American. Though unlike African honeybees, European bees did not adapt as well in the tropical regions of the world. Because of this, beekeeping organizations as well as the government of Brazil began projects in hopes to create a more productive honeybee species for the tropical environment of South America. In 1956, a scientist from Brazil brought what was known as a select stock of domesticated "African" bees (Apis mellifera scutellata) from Central South Africa in Pretoria, for cross breeding with the European honeybee. 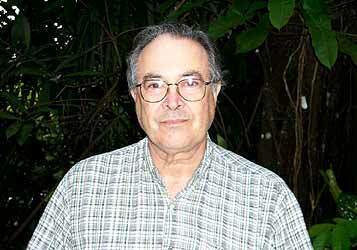 The scientist leading the project was Dr. Warwick Estevam Kerr, once defamed by those governing in Brazil, Dr Kerr is today an admired social activist. The "Africanized" honeybee (AHB) appears to have originated from Sao Paulo, Brazil at the Rio Claro Apiary, where Dr Kerr (pic) began working to make a more productive honeybee. During this project in 1957, it is said that 26 of Dr. Kerr's first generation hybrid bees were accidentally released by a visiting beekeeper who removed the queen excluder at the entrance of the hives (which keep the queen bee from leaving the hive). These bees spread and mated with the local European honeybees of Brazil. It is since understood that other beekeepers were also experimenting with African honeybees in Brazil. It's calculated that in 1982 (26 years later) these bees spread up through Panama, then within 4 years spread north through most of Mexico despite government programs set in place to stop the spread of this Africanized or hybrid honeybee. At the time of the initial release of Dr. Kerr’s hybrid honeybee in 1957, Brazil ranked 27th in honey production. Three decades later, after the introduction of the Africanized bee, Brazil sky rocketed to 4th worldwide in honey production. Local beekeepers around the region were also experimenting with the AHB. Though causing initial hardships, the Africanized honeybee (known as the Brazilian bee or the "brave bee"), is now the preferred bee for beekeeping in South America, Central America, and some areas of Mexico. 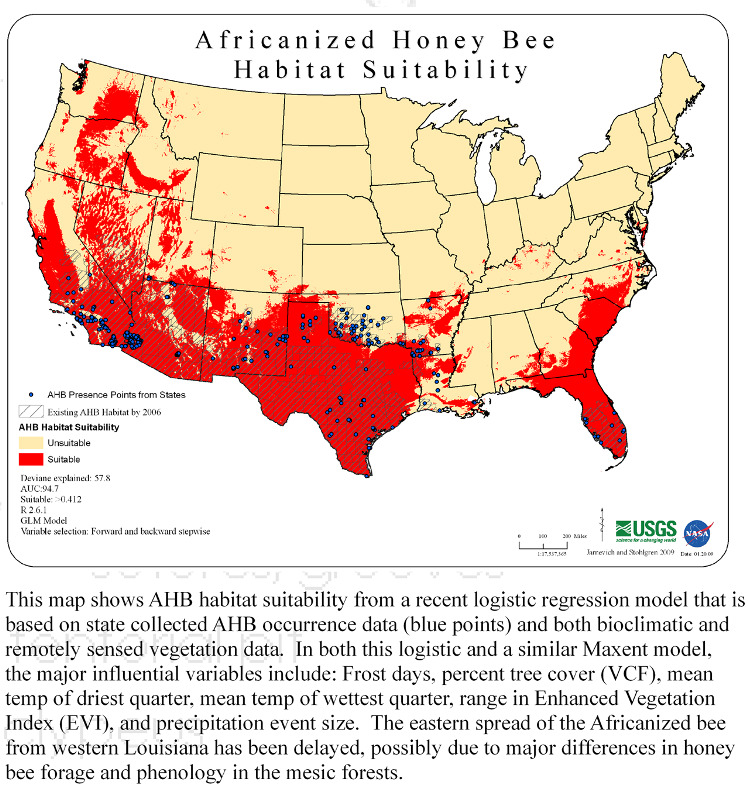 Below is a map of the original estimated spread of the Africanized honeybee from Sao Paulo Brazil in 1957 by the Harvard University Press, re-animated here by Adkins Bee Removal. 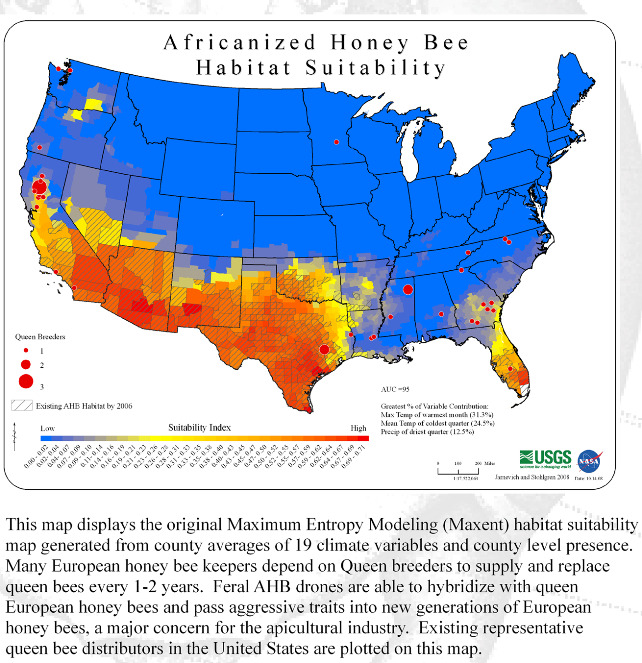 Below is a map of Africanized honeybees spread though much of the US. These said Africanized honeybees first arrived in the U.S. in 1990, where the first AHB hive was reported in Rio Grande, Texas. Africanized honeybees are slowing their pace as they move northward into the United States. In these areas, existing European honeybee are becoming mixing with the AHB. This is believed to be aiding in the sharing of behaviors and traits from both the AHB and European honeybee, leading to the more docile European honeybees become slightly more aggressive while the more aggressive Africanized honeybees become more docile. There is said or claimed to be both desirable and undesirable outcomes. One benefit of the mingling of genes and traits is that the weaker populations of European honeybees are becoming healthier, thanks to their African cousins stronger immune systems. Another factor is that Africanized bees have trouble surviving cold weather. This is because with tropical warm weather and they can keep their hives relatively small, not needing to store large amounts of honey to survive through the winter. Less bees that make up a smaller hive, not do so well during the winter season specifically in the northern continental US; as the cold air gets to the core of the beehive much sooner than a larger beehive with a greater mass of bees, this plus a shortage of honey to make it through a longer winter causes Africanized bees to have difficulty surviving in cold weather. Are There Africanized Honeybees / Killer Bees in my State? The map above shows the spread of AHB. The Africanized bees have slowed their pace, although with time are adjusting to colder climates; however, Africanized bees today in the U.S. are not like the same bee of Kerr’s day in 1957. This AHB is no longer genetically identical to its origins of 53 years ago and is less hostile. Beekeepers from Northern California, Oregon, northern Florida, Utah, Colorado, Kansas, Missouri, Tennessee, Georgia, or the beautiful states of North and South Carolina, will likely here talk about Africanized bees. Some U.S beekeepers prefer honeybees with the africanized gene strand as studies have shown the bees as well as the beekeepers have shown them less susceptible to diseases. U.S. Africanized bees seem less hostile then even 10 years ago. To give you an example, 95% of all bee removals I performed in 2009 near the border of Mexico were simply wearing a ball cap and gloves. However this is not always the case. But dealing with thousands of these bee colonies per year, bee removers come across less feral bees then years past. After ten years of specializing removing bees from undesired locations, we are finding less bee colonies to be highly aggressive. In some cases, these bee colonies have been provoked a good deal before our arrival. 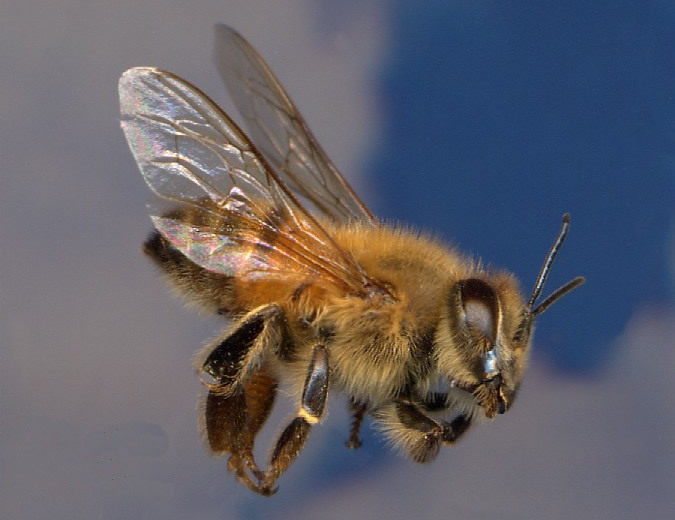 Honeybees, like animals, can become conditioned to respond to perceived threats. • The new hybrid Africanized honeybees were much more aggressive then the European bees causing initial challenges to the general public with more bee stinging incidents. • Beekeepers (and perhaps local governing bodies) had to re-adjust their practices, regulations, and learn how to work with these more aggressive honeybees that were spreading across the continent out performing the European honey bees. • At the time, Dr. Kerr had been protesting against cruel actions of the Brazilian government. Because of this, the powers in turn began spreading harmful rumors about Dr. Kerr's work to discredit him, calling him a mad scientist that released the "killer bees" to wreak havoc and cause harm to the people of Brazil and South America. • An unmentioned propaganda could have been for financial purposes, as South America had much to gain and the US and other countries would incur a loss if this new hybrid bee performed much better across the entire tropical region than the European bee of the time. These factors perhaps caused some amount of panic in South and Central America, and North America. The government of Mexico devised a plan of action to stop the northern spread of these Africanized honeybees but the spread continued. State and regulatory organizations in the U.S. watched as this hybrid honeybee continued its movement successfully through Mexico toward U.S. borders. By the time these Africanized bees arrived in the US, the bees had spent 40 years adjusting to the new landscape and lifestyle, mixing in with the local European bees of the Americas and also being domesticated. Today, 60 years later, this hybrid bee continues to intermingle and settle with what many believe a much lesser degree of hostility. AHB's can be unintentionally transported by ship, then the bee swarm absconding or splitting sometime upon arrival at seaport. "In 2001, our team of researchers developed a selection technique to improve bees, which are actually utilized by beekeepers in the Eastern Mexico. After selection of three generations of bees, we concluded that determined AHBs family lines could inherit their high levels of tameness, even when they reproduced in the condition of free fecundation. (Natural mating)" africanized bee studies. In the U.S. a large amount of money is made in Queen Bee rearing and in the sale of replacement bees and more recently a much greater amount due to what has been coined by the media as Colony Collapse Disorder in which a portion of beehives fail (mostly beehives that are transported). Today and in the recent years, with colony collapse disorder and the difficulty of keeping healthy bees, is still an ongoing effort of some beekeepers to capture traits from this hybrid bee that has successfully intermingled though the Americas. Mexico appears to be studying or observing these bees. Like the US, when visiting forests or parks, you may see skinny bee boxes a little ways up on trees, designed to encourage migrating bees to move in. Several factors may go into judging a bee hives behavior or aggressiveness. What can factor in on bees aggressiveness, or helpful to know is bees living high up in a tree for example owl boxes, tend be much more aggressive then beehives that are lower to the ground. From fairly higher up locations they are seldom disturbed and seldom experience human interaction. Of course a hives aggressiveness is partially due to how long they has lived at the location. More recently, an acquaintance mentioned to me that his cousin and a friend (around highschool age) from central Mexico occasionally go into the hills and take honey from wild beehives living on hill sides, tree voids, and other natural places; not from beeboxes that are maintained. His cousins would show him the few stings they would get on there hands while removing a portion of the honeycomb. They likely dont use beekeeper equipment like a bee smoker. Another certain and likely common story from the same region of central Mexico was finding a beehive living low in the trunk of a tree, the bees were very non-aggressive when approached and observed. It would help to speak to beekeepers and get their feedback as they work with managed honeybees regularly. It is claimed that AHB's cannot be identified well by comparing them side by side to a European honeybee. AHB's appear 10% smaller in size than European honey bees and abscond (migrate or swarm) more often than European honey bees. Like European honey bees, AHB's also die after stinging. AHB’s are slightly faster with more agility. This Bee Id Chart has basic identification of the AHB, European honeybee, bumble bee, carpenter bee and tropical stingless bee. Common characteristics including identification, habitat, region, population and size. An Africanized honeybee sting is identical in severity to European honeybees, like the European bee it loses its stinger and dies shortly after it stings. Stingers are about an eighth of an inch long (0.32 cm) and half that size in thickness at the larger dislodged end (were the venom sac is). If stung by a honeybee the barbed stinger will typically get stuck in the skin as the bee pulls away, dislodging from the bee's abdomen. The small muscle on the end of the dislodged stinger will continue to pump venom through the needle-like stinger for up to a minute. The sooner the stinger is removed, the less swelling will occur. Whether you pull the stinger out, or scrape it out appears to be irrelevant. The more important factor is how long the stinger is left in, as well as how deep and how sensitive the affected area of the is. Researchers have found that more people think they are allergic to bees than actually are. In the US, about 0.55% of people are allergic to some type of bee and wasp stings. When people say they’re allergic to bees, they tend to categorize “bees” to meaning any insects that fly including wasps, hornets, yellow jackets, bumble bees and solitary bees, often not knowing the difference between a bite and a sting. The above mentioned are generally stinging insects with their abdomen, honeybees loose there stinger when they sting a human or mammal, but most bees and wasps don’t. The composition of the toxin varies slightly between these species, and if you’re allergic to one, it may not guarantee you’re allergic to others. In my case, when stung by a honeybee (apart from the initial scare) nothing of any great substance happens, perhaps a slight bit of unnoticeable redness and minimal if any swelling. Yet when stung by a yellow jacket I experience a large amount of redness, and a day or two of uncomfortable itching! Your body can build up a tolerance to toxins. A good example of tolerance is Bee Venom Therapy (BVT) an area of apitherapy, (in which a patient is purposefully stung to assist in healing an ailment. Eventually the patient is able to be stung with more stings at one time as the body builds up a tolerance to the toxin of the sting. As people approach retirement age, they can have less tolerance to stings. Some time ago, I was speaking with the former owner of Knoor's Candle Shop, which started out as an apiary. His father owned the apiary before him. He grew up around bees his entire life and worked with bees as an adult. Getting stung is a regular occurrence for beekeepers, but at that later time while doing some beekeeping, he was stung. He swelled up something good and was hurried to the hospital where a doctor told him he may now be allergic. With age it is believed tolerance level can weaken. Lawn mowers: Loud or vibrating noises including weed eaters, and motor trimmers can cause bees to become alarmed and feel threatened. It has been said that bees are also agitated by the smell of cut grass. Moving targets People often shoo away flies by swatting /waving their hand as if a fly; this aggravates bees if you near the nest. Calm movements can help bees not to feel like their hive is being threatened or attacked. Dark colors when aggravated dark colors are a target . Bees have likely been conditioned to target dark colors when defending the hive as AHB predators are animals. Light colors, a ball cap, and a long sleeve shirt with calm movements may help to not agitate bees. Exhaling Bees are conditioned to react to breath /carbon dioxide. For centuries animals have been attacking beehives with their mouth and hands. Bananas smell: It is said that the smell of bananas is similar to the alarm pheromone given off by a distressed bee. The purpose of the bee alarm pheromone is to alert the other bees in the hive of perceived danger. If you plan on working with bees don't bring bananas for a snack! When bees attack they typically target your head; things in fast motion like hands & arms are also targets. It is estimated that feral AHB's may protect their home with up to 4 or 5 times the amount of honey bees and produce more alarm pheromone than European bees. The danger proximity for an Africanized bee hive may be anything less than 15 to 40 feet. If the hive is disturbed, that zone will grow further in range. Smoke does two things to calm a beehive: Instinctively smoke causes bees to prepare to leave /abscond the hive do to a fire. In preparation bees fill themselves with honey to carry with them. The simple process of consuming honey causes the bees to be less aggressive. Smoke also helps disguise the bees defense alarm pheromone. Though bees are very protective of the beehive; if you were to come across a large amount of AHB's foraging on flowers, you will find they are non-aggressive. AHBs can become agitated more easily and stay alert longer than European bees. However not all AHB's today in the Americas demonstrate aggressive behavior, though the honeybees that do are often said to be africanized. 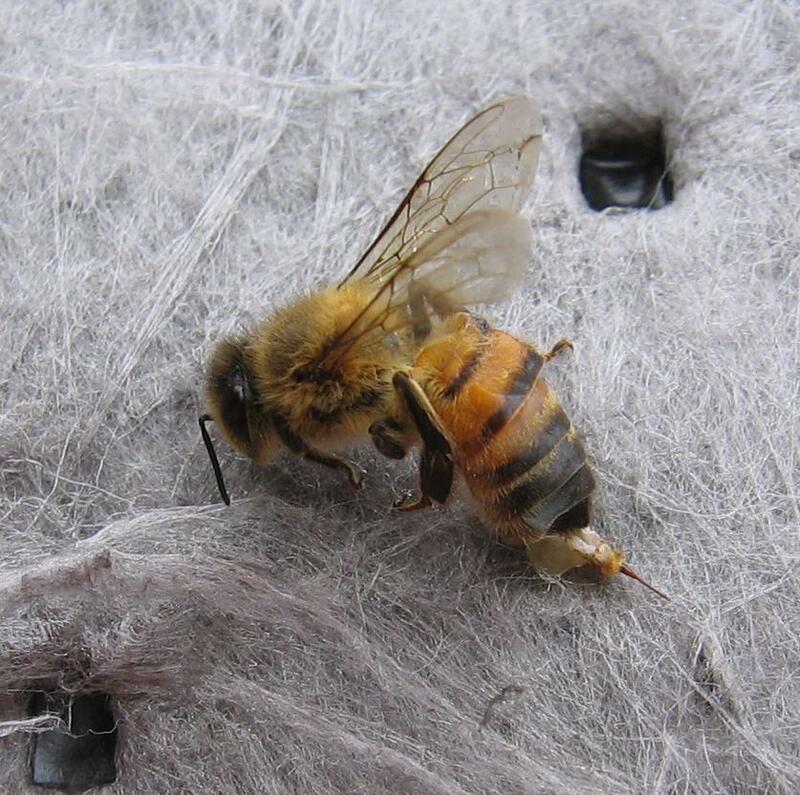 A beehives behavior or actions are well influenced by the conditions around them. When there are bee fatalities, africanized bees are often blamed. Why Have My Honey Bees Become More Aggressive? Have my bees become Africanized? 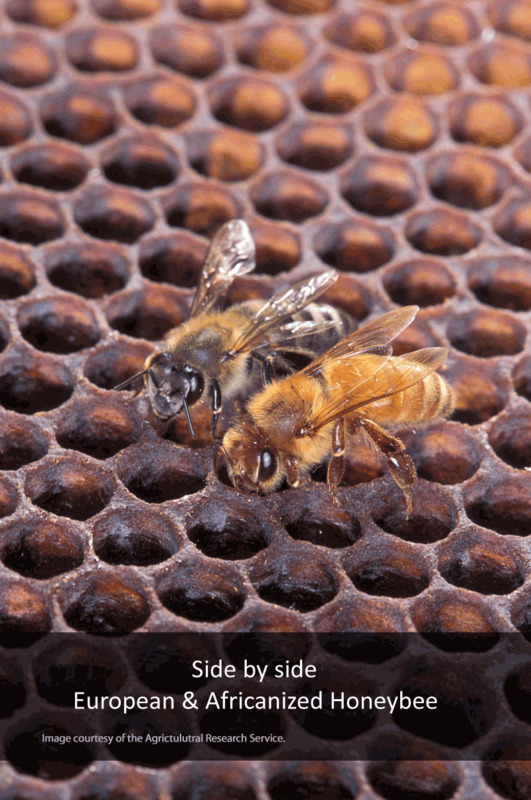 How can you tell if your bees are Africanized? These are questions many new beekeepers ask. Though I'm not an expert on this topic, generally, a good rule of thumb is how consistently defensive they are. Bees naturally can become more protective of their home the longer that they have been there. 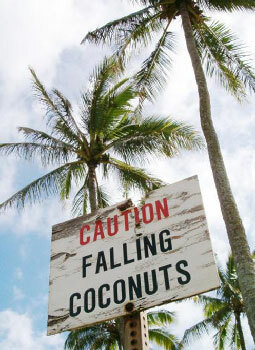 If its fall or winter, you may have nothing to worry about. Bees can be more aggressive or protective later in the season as opposed to spring & summer. This is because flowers are gone, and protecting the honey they stored is vital to their survival. It is said that docile beehives can be taken over by more aggressive honeybees. How many people die each year from Africanized bees? Since the arrival of the AHB in 1990, AHB's have caused some 14 or more confirmed deaths. However, in most cases, though the bees were said to be Africanized, a more accurate cause may be that victims were allergic to honey bee stings, and of the people that died most have been the elderly who are unable to escape as quickly and due to age can have more vulnerable immune systems. Below is a comparison chart of AHB stats, it compares AHB death tolls per year in America vs. other causes of deaths. Both European and Africanize Honeybees can be very dangerous. This list of events reviews dangerouse bees activity. *of the deaths by the said AHB, a portion of these people were allergic to bees. Nearly all bee removal is very difficult from a wall, roof, chimney or other structure. If the honey & comb is left within the structure new bee hives tend to return to that or nearby locations. There are typically five thousand to twenty thousand (5,000 to 20,000) honeybees in a bee hive and 10 to 80 lbs. of honeycomb. Removing AHB's can be extremely challenging and dangerous to persons or animals on neighboring properties regardless of where the bees are. If you are not experienced in bee removal, or removal of AHB's, you should not consider self-removal as an option. The same is generally recommended for European honey bees when found in walls, attics, and such structural voids. If you would like help regarding a bee problem call the bee removal hotline. If you are having trouble identifying the type of bee visit the bee id guide or, to learn more based on the beehive location visit how to get rid of bees for self help. One of the things we do at Adkins is connect beekeepers and bee removers with people that have bee problems. If you're a beekeeper, visit the free bees page. If your a beekeeper or carpenter that would like to recieve calls regarding structural bee remover Signup at work for beekeeper. Some counties in the U.S. provide free bee removal non-structurally. Beekeepers may also provide free bee or swarm removal. Perhaps due to a major decline in beekeeping, the average person knows very little about honeybees and their behavior. When a person notices a beehive move onto the structure of the house, wall, roof, or chimney, they may attempt to handle it them-self treating it like a wasp problem trying to spray to kill the bees or get the bees to leave. If the homeowner is persistent in their many attempts to kill or chase off the bees, this conditions the bees to be more aggressive in protecting themselves. After some frustration on the homeowners part they call a bee remover. On arrival and during inspection of the bee remover, the bees immediately attack. Many bee removers automatically assume the bees are feral or Africanized. Perhaps in some cases, the remover or pest control technician is told up front that the bees are really mean.What is failed to realize is this is not the true nature of the bees. Even if the bee guy has a few years of experience as a bee remover, it is not something that’s easily recognized; consequently this gives the bee remover, or exterminator an inaccurate view of the bees behavior. Typically when you first approach a beehive that has not been harassed, the bees can show some amount of aggression toward you perhaps 80% of the time or less. However after 5 minutes or less of working with the bees without intention to harm them, the bees will generally become non aggressive after realizing your not there to attack them. You can continue reading this case study regarding bee removal guy and public mislead regarding angry bees. Another common case of mistaken identity of honeybees may be profit driven. A homeowner calls the bee guy or exterminator to get rid of the bee problem, when the guy arrives using scare tactics, tells the homeowner that the bees are Africanized killer bees and they have to have them removed and killed immediately. Though that is becoming less common year by year. If you are trying to get rid of angry bees, a lot of your success will depend on the location of where the bees are that you are trying to get rid of. Visit how to get rid of bees, to learn more about getting rid of bee hives on your property and for help in understanding or solving your bee problem. Are Africanized Honeybees Bad Bees? Honeybees from Africa and bees from Europe have much more in common than they have differences. Africanized honeybees, initially branded "killer bees" have a bad rap for being more aggressive and protective when defending their homes. In tropical areas of South America and Africa, africanized honeybees directly influence nearly a large amount of the landscape. AHB pollination. Africanized honey bees are highly effective pollinators; AHB's are said to get up earlier in the morning and stay up later working longer than European honeybees. Unlike European honeybees, AHB's work during overcast cold conditions and in light rain. Africanized honeybees are better suited to survive desert like climates and droughts. Africanized honey bees are said to carry more pollen than European honeybees. They can also produce more honey per bee than European honeybees. AHB's have a stronger immune system; they are less susceptible to mites and other diseases. Though the average person is unaware, AHB's have become the standard for beekeeping in South America and most of Central America, these countries have become leading producers of honey, yielding a much greater amount than when European honey bees were used. For many years scientists had been concerned that AHB's would be a major threat to other 'tropical' pollinating insects and stingless bees by outperforming them. Recent Smithsonian studies suggest a much smaller impact on native and local tropical bees, as these other tropical pollinating and stingless bees seem to be able to hold their own in foraging for food. Africanized honeybees have not been reported to be affected by the major phenomenon of Colony collapse disorder, (CCD) an effect where honey bees mysteriously abandon the beehive. Bees make honey to eat, they store it to survive through winter. Raw honey is unprocessed honey directly from the beehive, an example can be like eating a fresh orange from a tree vs drinking store bought processed orange juice were many of the nutrients are killed and preservatives and artificial flavors may be added. Raw honey is used in several ways. It is an excellent source of Energy for the body. It is used for burns, for large or small wounds, scratches abrasions scrapes, for food ulcers, cataracts or for pink eye. Honey is a great source of fighting Infections including colds, coughs. Honey can be used to fight dandruff or as a skin softener. Honey should never be given to or consumed by a young baby /an infant, doing so can cause death. The practices of beekeeping with European and Africanized honeybees are different. In South and Central America, beekeepers are said to wear full protection when beekeeping, and take more precautions in crop pollination and managing the Africanized beehives. Unlike South and Central America, The U.S. is split between cold and warm climates, though the AHB can thrive in the warmer region of the U.S. It has difficulty surviving the colder northern regions.